ANY chemicals brought into art labs, must have the appropriate National Fire Protection Agency (NFPA) labels upon the containers they are in. Any chemicals subsequently placed into bins, bottles, and other containers MUST also be labelled accordingly. Review the Safety Notebook in the art lab or use the MSDSonline to locate the chemicals and proper information for ratings on label. 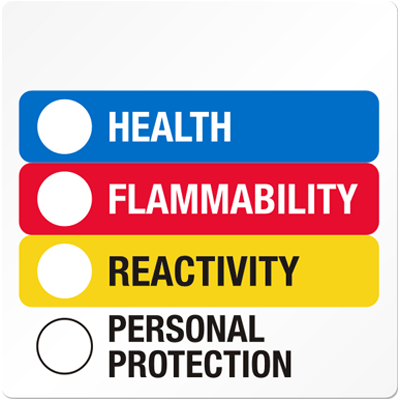 Shown to the right, NFPA Rating labels have a diamond or designated color fields which transmit the relevant information from the MSDS (Material Safety Data Sheets).